Our Resort Boarding Policies help ensure the health, safety and comfort of your pet. $50.00 non-refundable deposit is required to hold and guarantee boarding reservations. Cancellation without 7 days notice will have deposits forfeited. If the appropriate 7 days notice is given, your deposit will be used towards a future boarding date. Payment is due for entire reserved stay if your pet is picked up earlier than expected. The office is closed on all holidays for drop off or pick up. Current vaccinations are required for boarding and must include the following: DHLPP, Rabies, and Bordetella. All pets must be treated for flea and tick prevention. These vaccinations must be administered at least 7 days prior to boarding. Vaccination records must be emailed or brought in at least 72 hours prior to arrival. If your pet is past due on vaccines, La-De-Da Spa LLC, has the right to refuse for boarding and charge a cancellation fee as listed above. ∼ Vaccine proof can be emailed to info@ladedapetspa.com by your vet or you can take a picture of the proof and attach it to the email. Clean, fresh linens provided everyday. 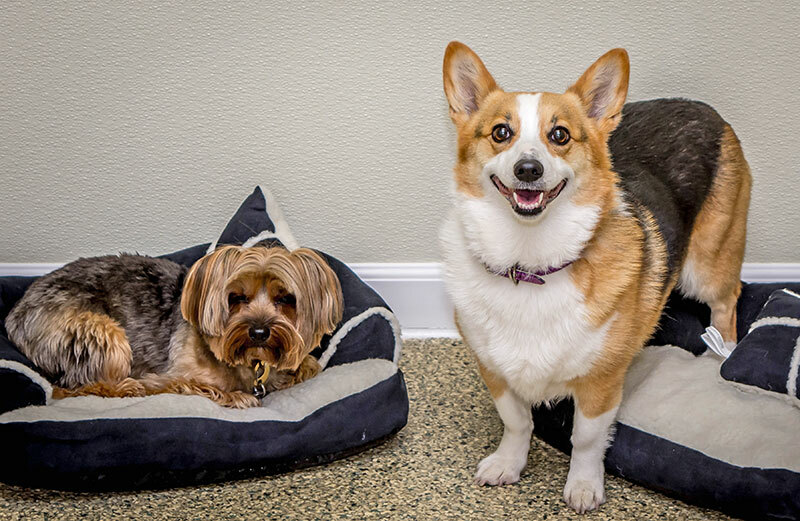 We also provide all comfortable beds, blankets and toys to make your pet feel right at home. 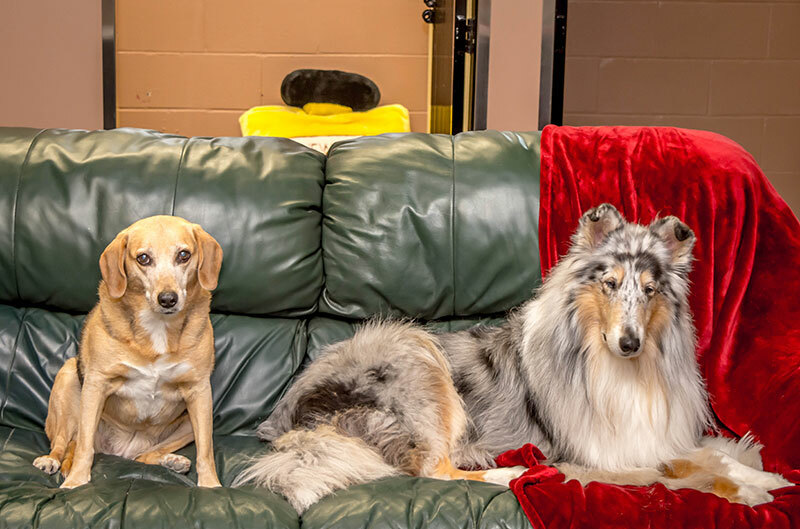 We enforce and have strict policies for sanitary reasons we only accept one small blanket and one toy, we do not accept bedding, bowls, or crates of any sort and will returned upon check -in. Food/water bowls are provided. We also have raised feeders and slow feeder bowls upon request. Please put all food in labeled baggies or containers not exceeding 5lbs per container. We do not accept large food bags or storage bins. All medications must be in original bottle with correct instructions on the label. Medication fees apply per day. Dogs over 10 years old will require a vet release for boarding. Book your pet’s boarding stay today! THE SUITE LIFE AT LA-DE-DA! La De Da Dog Boarding provides the loving care and exercise your companion needs and keep them so busy they will not miss you as much! 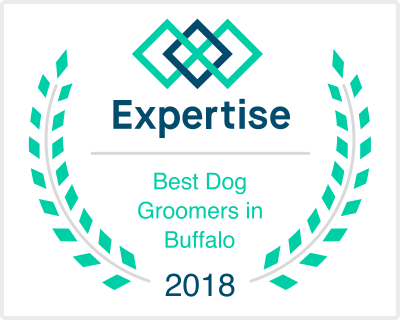 Boarding Care includes supervision and OVER-NIGHT staffing as well as daily indoor/outdoor playtime, in a play yard just for resort dog boarding guests! Your dog will enjoy a private suite with a flat screen TV, soothing lighting, and clean, comfortable bedding. 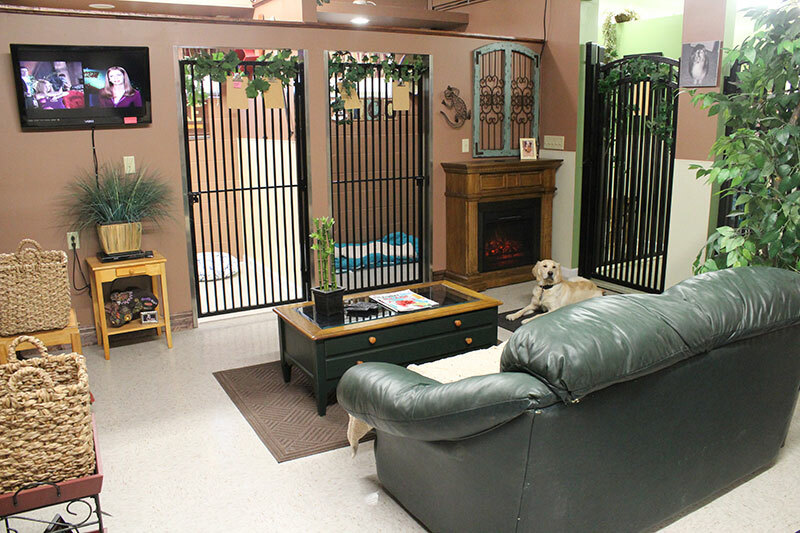 The resort dog boarding area also offers a private play yard for your dog to exercise daily!